Like generations of sailors, dung beetles use the stars in the night sky to find their way. That’s the conclusion made by a team of researchers who studied the behaviors of these insects. 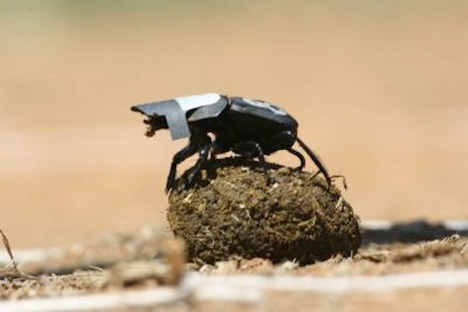 When dung beetles come across a fresh pile of poo, the competition is incredibly fierce. The bugs have to roll a ball of dung and then quickly move it away from the large pile to keep it from others that want to steal it away. What interested researchers was the way the beetles are able to move their dung balls in perfectly straight lines away from the pile. The research team believed at first that the bugs were using the moon to orient themselves – but even on moonless nights the beetles’ escape routes tended to be straight. The scientists fitted dung beetles with little caps like the one in the images above to block their view of the night sky, and suddenly the bugs began rolling their dung balls in wild, unpredictable patterns. 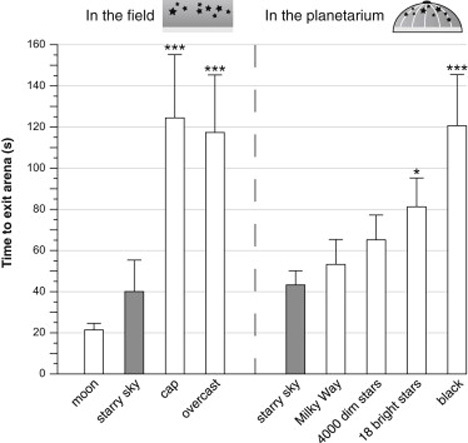 As seen in the data set above, dung beetles were studied in several conditions: with a visible moon, with visible stars, with no visible night sky markers, and with a cap. In all cases, the bugs were able to find their way much faster when they could see the moon and/or stars as they rolled their dung balls. Specifically, the beetles used the Milky Way to navigate even when the moon wasn’t out. This makes dung beetles the first insects known to navigate by the galaxy, joining the ranks of other creatures like birds, seals and humans who do the same. See more in Earth & Nature or under Science. February, 2013.